Buy 2014 Chinese Panda Smithsonian Gold Coins | ?? 1盎司2014年中国熊猫史密森学会NGC PF-69超浮雕金币 Americans love Gold Pandas. Now, to honour over four decades of Chinese giant pandas at the National Zoo, the China Mint and the Smithsonian Institution are releasing these special issue Panda Gold Proofs. 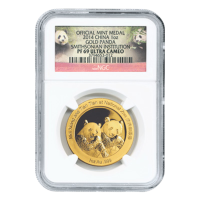 Struck in ounce of 999 pure proof gold, each Smithsonian Panda Gold Proof features the National Zoo's current Panda pair: Mei Xiang and Tian Tian. The obverse of each depicts the Great Wall of China alongside the iconic Smithsonian Castle on the National Mall in Washington, D.D. with the words "Smithsonian Institute 2014" engraved around it. The reverse features a depiction of Mei Xiang and Tian Tian at the National Zoo in their habitat with a bamboo background and the words "Mei Xiang and Tian Tian at National Zoo 1 oz Au 999" engraved around it.